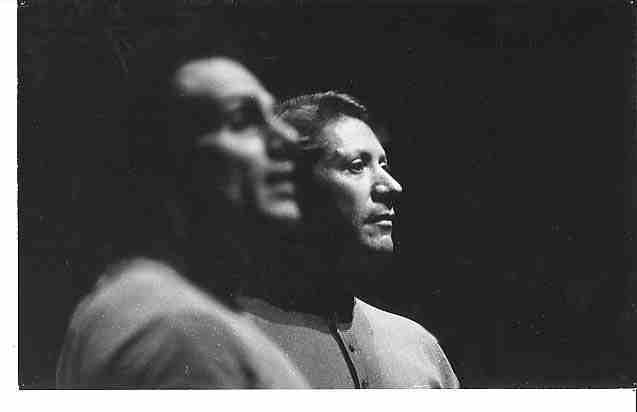 Text "Hollow Men" from disc "8 Octave Voice"
My first and only singing lesson with Alfred Wolfsohn. My one lesson with Awe took place after I had been taking lessons with Roy, on a weekly basis, for about a year (probably during 1957). Awe expressed an interest in hearing my voice so that he could get to know me a little more. I was very nervous and after the first fifteen minutes of the lesson, I was completely soaked in perspiration. Roy was present during the entire lesson. There was a brief pause at this moment and Awe, with a wicked sparkle in his eyes, said "Purity, purity". The implication being that my voice was completely white and lacking in any colour or lifeful resonance. We continued for a further five minutes with the lesson and I was again soaked in sweat from the effort of trying to produce some kind of embodied sound. At this point, twenty minutes from the beginning of the lesson, Roy intervened and said, "That's enough now Awe," Awe smiled and complied, as I was ushered out of the studio, Awe turned to Roy and said, "He reminds me of the title character in Dostoyevski's novel 'The Idiot'." Clearly my voice, at that time, was unconnected to any bodily effort that I had made. Roy continued to struggle patiently and persistently to bridge that gap in me for many years. For which I am permanently grateful. Thanks to these efforts, I have, today a deep resonant base voice. Index page of "The 8 Octave Voice"